In the last several weeks, word of an upcoming Android 4.4.3 release started spreading around, for the most part based on sightings of new build numbers in server logs and bug reports, along with this tip by @LlabTooFeR. Of course, with so many 4.4.3 mentions, it's no surprise that these are actually legitimate and not creations of random trolls. According to a source familiar with the situation, Android 4.4.3 is, unsurprisingly, going to be a pure bug-fixer release. We shouldn't be seeing new features or UI changes - Google is saving those for a more major release (let's not speculate on 4.5, 5.0, etc. - it's way too early for that). 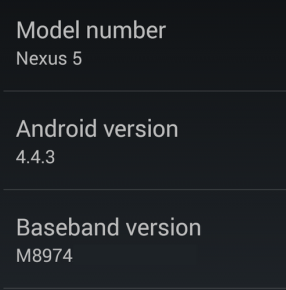 Instead, the Android 4.4.3 changelog is going to be comprised of several dozen fixes which are summarized below. Sorry for the lack of exact details for every change - you'll have to wait for further leaks or the official release to AOSP so we can run a diff (not like Google is going to itemize every low-level change). 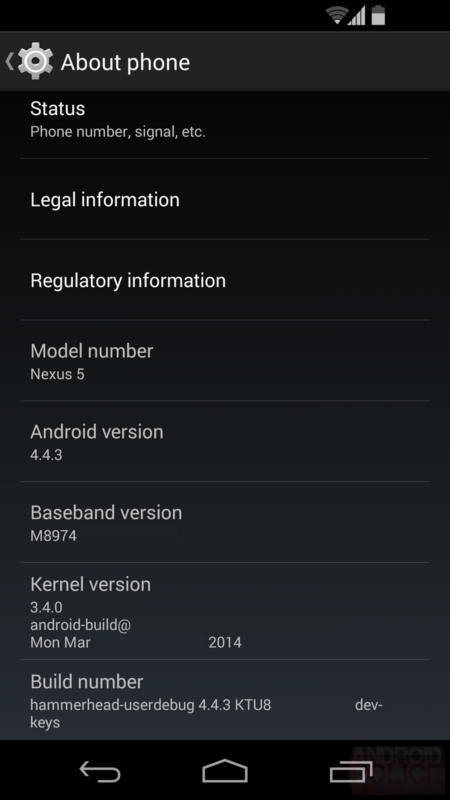 To further reassure us the information is accurate, the source included a screenshot of 4.4.3 running on a Nexus 5, with some parts redacted. I think out of all these, I'm most excited about improvements to the camera focus, which has been absolutely abysmal for me on my Nexus 5. Strangely, I've heard that not everyone is afflicted with the terrible focus curse, so I suppose some of you will be more thrilled than others. Of course, wakelock, data, Bluetooth, and other serious fixes are welcome too. At the moment, there is no word on the final release timeline. Hang tight though, as it shouldn't be too long.